While he only has one Cup win and two Xfinity Series wins to his name, Bobby Hillin Jr. was a regular on the NASCAR national circuit from the 1980’s to 2000. He raced in two races in the late 2000’s, one in 2008, one in 2009, both in the Xfinity Series. He is now retired from racing, and working for T-Rex Engineering & Construction, which he founded in 2001. From 1998 to 2000, Bobby Hillin, Jr. raced for Bobby Hillin Racing. In 1998 and 1999, the team had some success, with 1 top 5 and 5 top 10’s in 1998, and one top 10 and 2 top 10’s in 1999. The team did have 5 DNQ’s in 1998 and 4 DNQ’s in 1999. 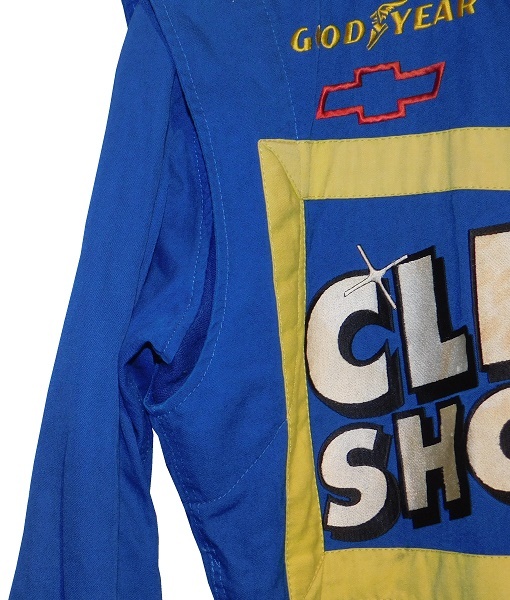 For a number of races, they were sponsored by Clean Shower cleaning spray, and during that time, one of their crew members wore this firesuit. The suit itself shows decent use, with some scuff marks, and some material snags. The collar is a standard collar, with CLEAN SHOWER logos embroidered on the sides. 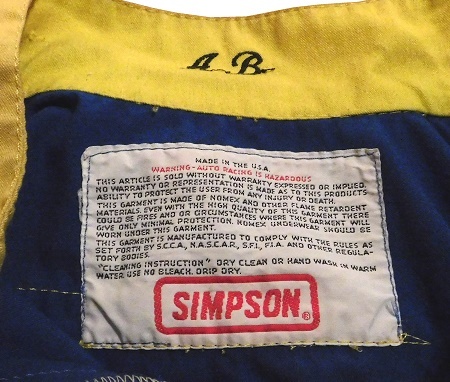 The standard Simpson Warranty Label is in the cowl. The initials AB are embroidered into the back of the collar. 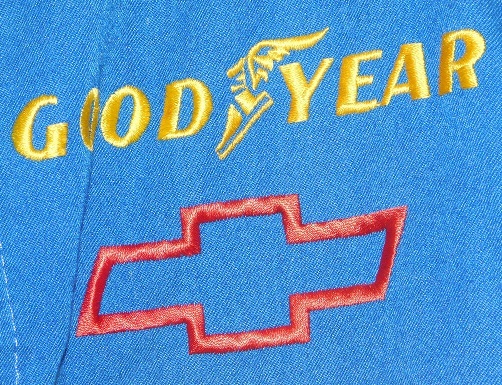 The right chest features a yellow GOODYEAR logo, and a red Chevy bow tie logo embroidered into it. 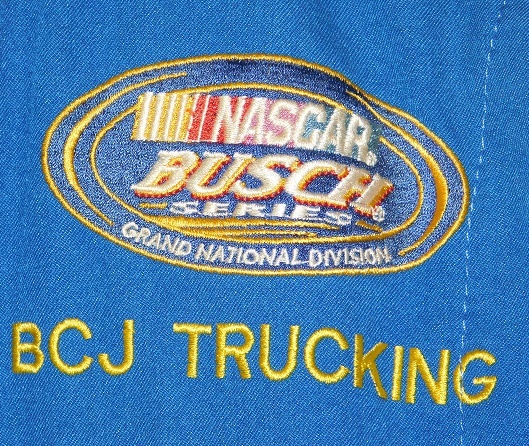 The left chest features a BUSCH SERIES GRAND NATIONAL DIVISION logo and a yellow BCJ TRUCKING logo embroidered into it. 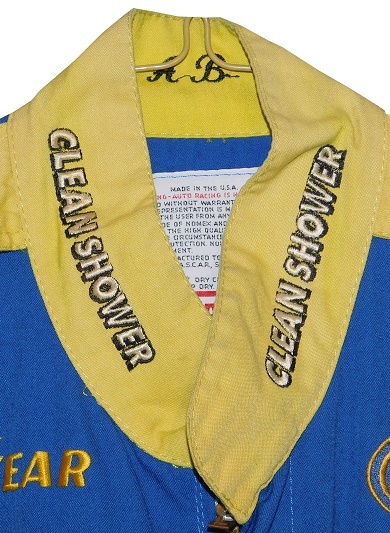 The front torso features a large CLEAN SHOWER logo. The blue belt is unadorned. 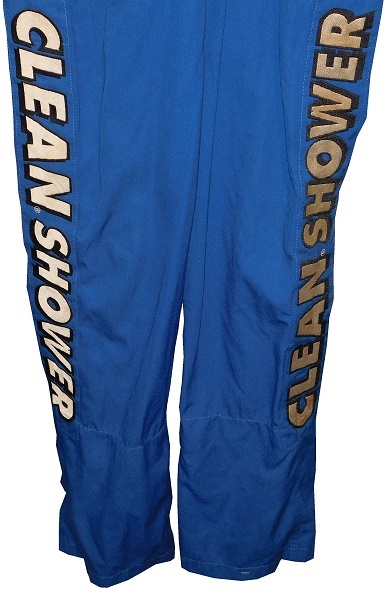 The legs feature CLEAN SHOWER logos in television position, and some wear on the cuffs. The yellow shoulder epaulets have white and black CLEAN SHOWER logos embroidered into them. 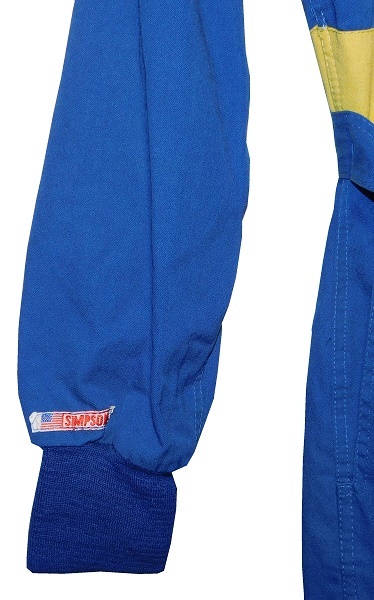 The right sleeve is unadorned, except for a tiny Simpson patch on the end of the sleeve. 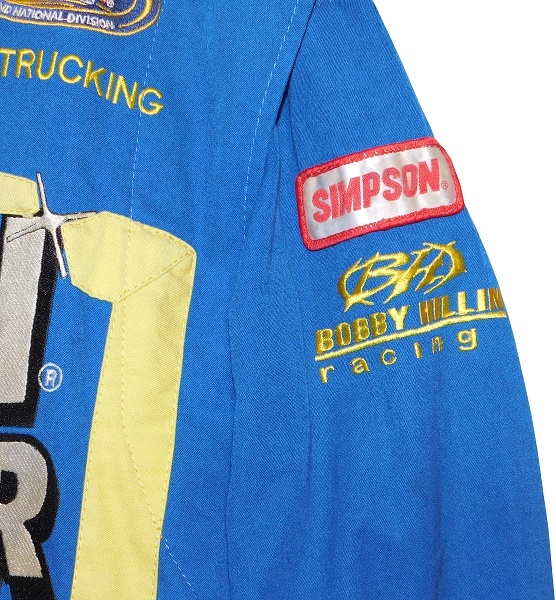 The left sleeve features a SIMPSON patch and a BOBBY HILLIN RACING logo embroidered into the top, and nothing at the ends of the sleeve. 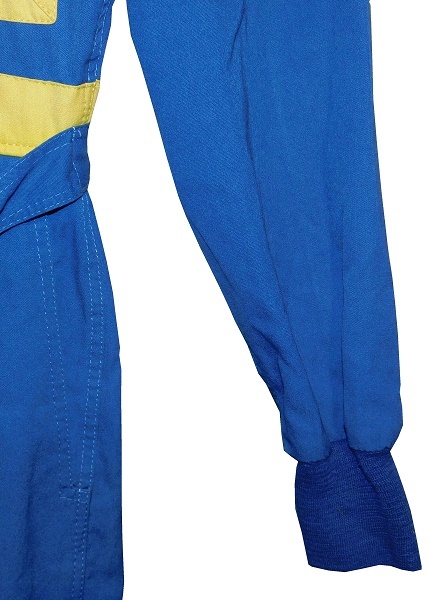 The back of the suit features some light wear on the torso. The back of the neck is unadorned. 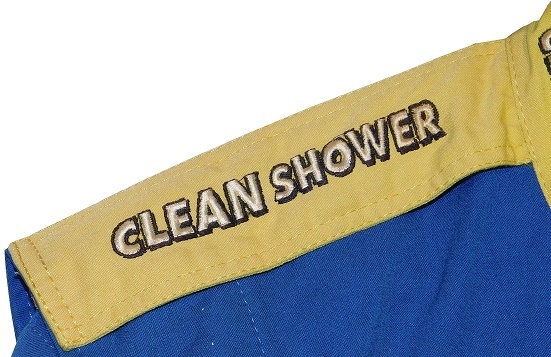 The back torso features a giant CLEAN SHOWER logo. There are some scuff marks below it. Just above the waist on the back is a yellow strip with IT WORKS YOU DON’T embroidered into it in blue. Bobby Hillin Jr. is a driver who was never a superstar, but who was an honest, hard working driver who had a decent fan base. He had a good career, and it’s great that he’s now found his calling as the owner of a construction company. He is missed in NASCAR though, and I hope he shows up at a race soon. Next week, a more modern suit with a unique design.